It may be hard to believe given the weird way time works in Trump’s America, but Thursday marks the one-year anniversary of special counsel Robert Mueller’s investigation into all things Donald Trump. Stephen Colbert spent a chunk of his monologue on “The Late Show” Wednesday night celebrating that fact and checking in on how things are going with the Trump camp. Then Colbert checked in on what’s going on with Trump himself. That, Colbert then noted, is perhaps not the most comforting way to frame this situation. From there, it was time to look at what Trump’s strategy for dealing with Mueller seems to be — and, unsurprisingly, it’s a strategy that has more to do with fighting public perception than the investigation itself. “Trump also complains that ‘he needs better ‘TV lawyers’ to defend him on cable news.’ ‘Jared, get me Matlock on the phone. What’s that? He’s dead and never really existed? That’s a mystery. Get me Mrs. Murder, She Wrote! Get me Colombo.’ And who does Trump think is a TV lawyer upgrade? 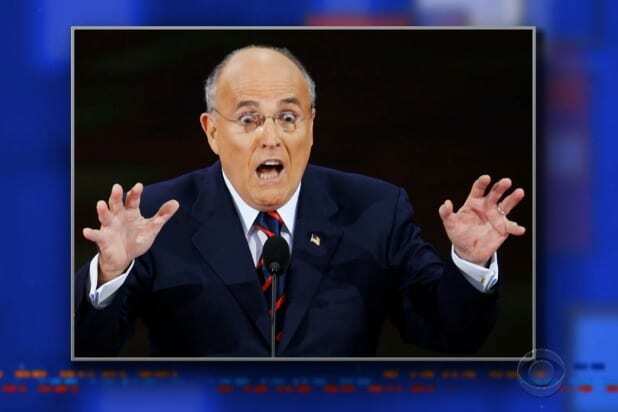 Former New York mayor Rudy Giuliani, seen here in a community theater production of ‘Nosferatu,’ ” Colbert joked as this image appeared on screen. “The Late Show” then played a clip of a car driving over the side of a cliff. “I’m so glad they were wearing seatbelts. We checked, they’re fine, right? They’re telling me they’re totally fine. A little stiff in the shoulders when it’s cold. But some people in the administration are already looking towards the future because President Trump’s campaign aides are quietly launching his re-election campaign,” Colbert said, a comment which drew boos from the audience. You can watch the political portion of Colbert’s monologue in the video embedded at the top of this post.